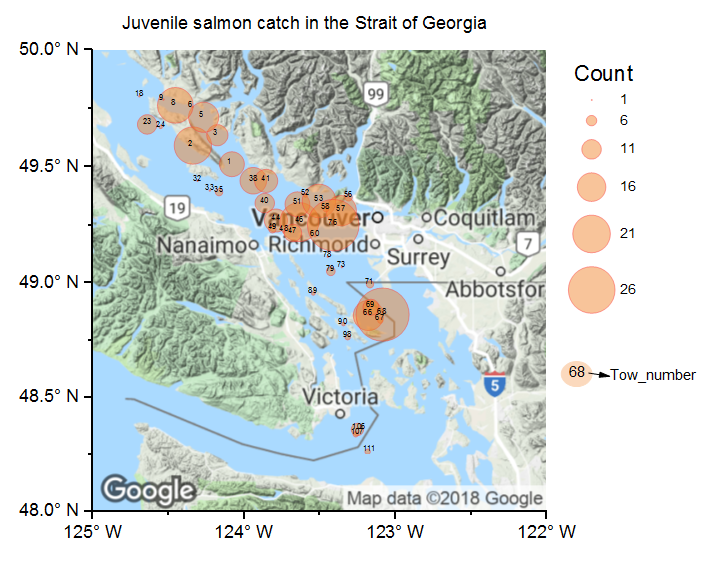 In this example, we will show how to import a Google Map image into Origin and set it as a background of a existing graph. Before continue with this example, make sure that you have downloaded and installed the Google Map Import app. Then you can download the project file and launch it in Origin. There is a bubble plot graph in this folder. If you’d like to know more about making bubble plots, please check this page. 1. With the graph activated, select the Google Map Import app. 2. In the dialog, click the Preference button on the upper left. Make sure the scale is set to 1280 X 1280 to guarantee a high-resolution image. Click Back to go back to the main panel. 3. Click the circle button to load the graph scale. Set the Map Type to Terrain. 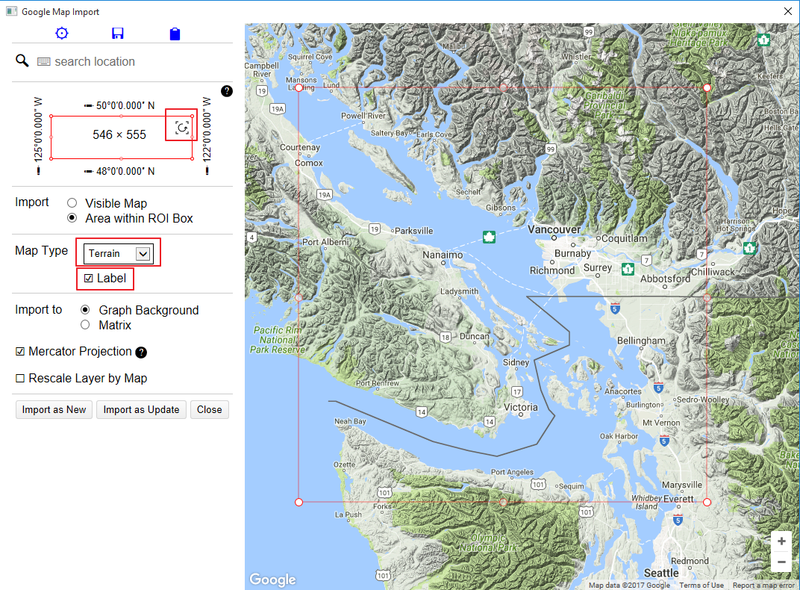 Check the Label checkbox to show labels on the map. Use mouse scroll to zoom in the map and more location labels will be showing on the map. 4. 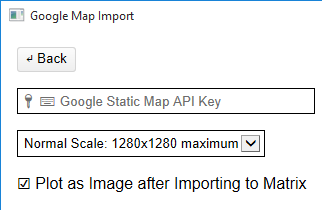 Click Import as Update to import the map into the graph. Note: In case you want to delete the background image, select Edit:Button Edit Mode. 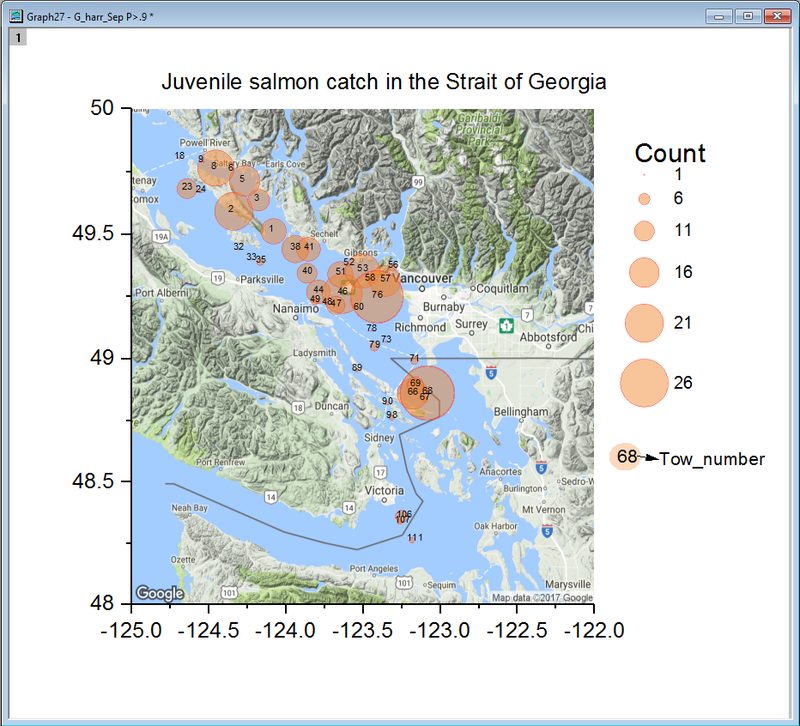 Then the background image on the graph can be selected and deleted. In Origin2018b you can change the axis labels to DMS format and in the upcoming release of Origin 2019 you can specify the DMS format as Latitude and Longitude with N or W text. Note that the latitude and longitude data in Column A and Column B are already set to DMS format. 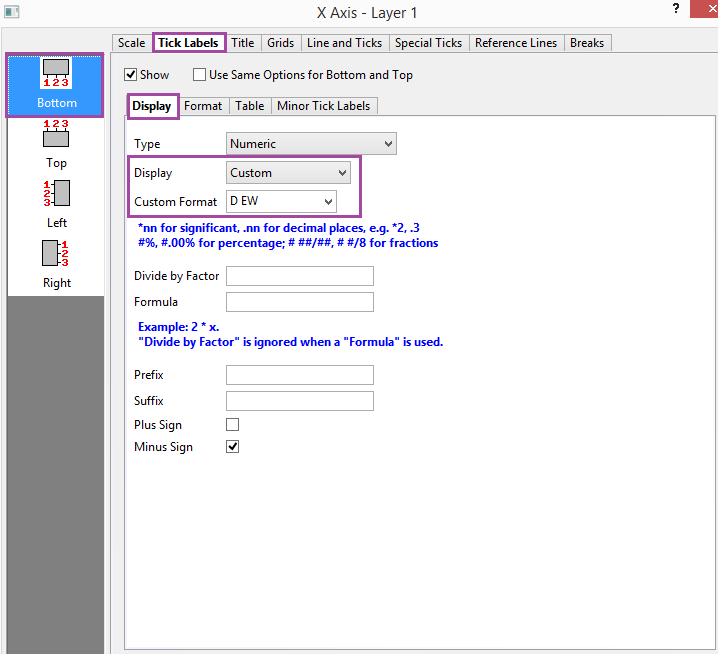 Even with the cell format set DMS in a worksheet, you will still need to change the axis label format to DMS after plotting. 5. To change the axis tick label from Decimal to DMS, first double click the axis to open the Axis Dialog. Select Left in the left panel to edit the Y-axis tick labels. Select the Tick Labels tab and Select Display. Under the Display tab select Custom which will add a Custom Format tab. 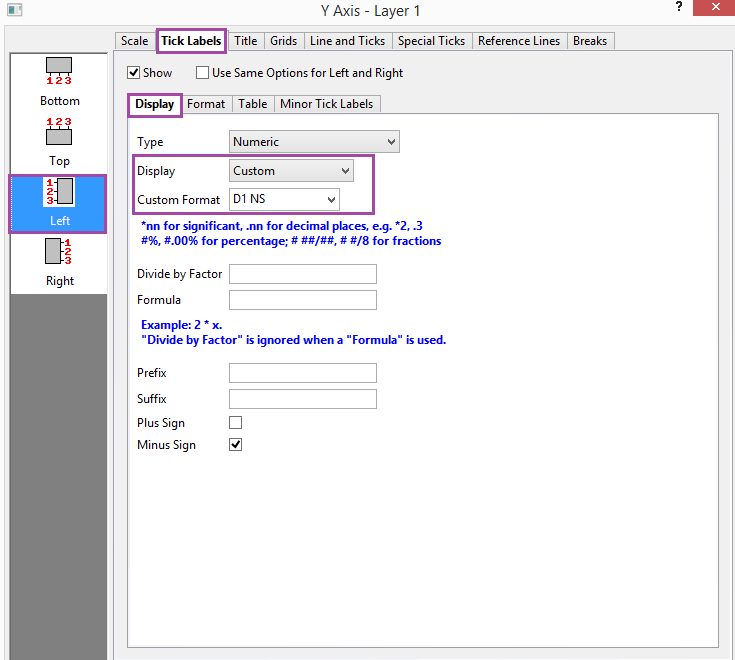 For Custom Format input D1 NS to specify the axis label as Degrees with one decimal place in the NS direction (Latitude). 6. 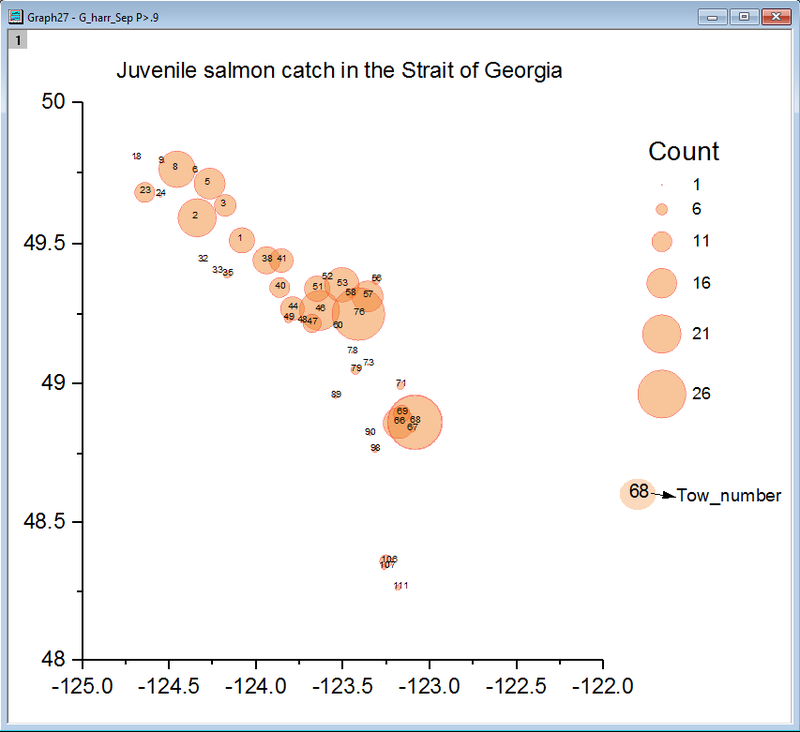 To edit the X-Axis Tick Labels, Select Bottom in the left panel and Select Tick Labels and Select Display. Under Display, Select Custom and under Custom Format: input D EW. This specifies the tick labels in Degrees (with no decimal) in the EW direction (longitude). 7. 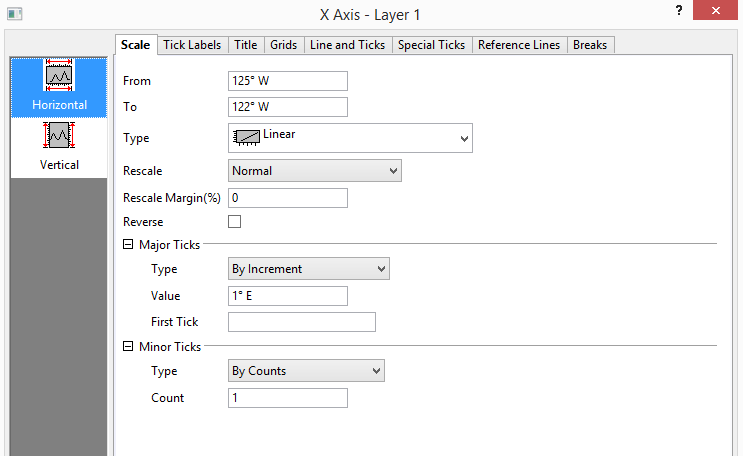 Before closing the Axis Dialog, select the Scale tab and under Value for Major Ticks change the value from 0.5 to 1. Select Apply. Your final graph should look like the figure below.